Kopi Luwak coffee. You’ve heard of it before: the coffee consumed and excreted by palm civet cats in Southeast Asia, washed off by resourceful locals and served by annoying dinner hosts to their unsuspecting guests for the sole purpose of declaring, “guess what you just drank!” Kopi Luwak coffee is, in more than one way, the coffee of assholes. Respected specialty food retailer Dean & Deluca recently bought-in to the novelty, offering 50g of the stuff for $50 (or $453/lb) $70 (or $634/lb), so there must be some legitimacy of quality or flavor to support this hype, right? Wrong. To dispel the myth once and for all: Kopi Luwak coffee is a gimmick, a fairy tale fabricated to sell gullible consumers bad coffee at extraordinarily inflated prices. Please read the recent article written by Lily Kobuta of the Specialty Coffee Association of America that debunks any validity that Kopi Luwak might have as anything more than a cruel novelty. 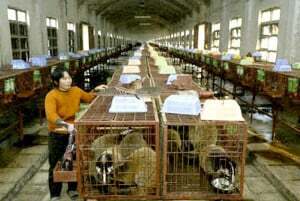 Roasters and retailers who sell Kopi Luwak are either uneducated about specialty coffee or are otherwise carelessly complicit in the propagation of a myth that, at best, sells unknowing consumers coffees of poor value and at its worst, tortures and kills thousands of innocent animals each year for the sole purpose of making unscrupulous vendors more money. Where does Kopi Luwak coffee come from? 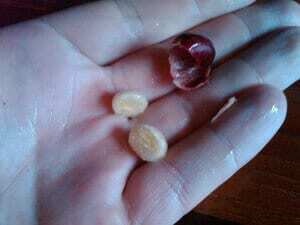 The coffee that we drink is nothing more than the seed of a fruit, the pit of a coffee cherry. Coffee, like other fruit trees, grows and bears fruit that ripens and falls to the ground or is otherwise selected by animal counterparts (or other methods) to spread its seeds elsewhere and grow more plants. 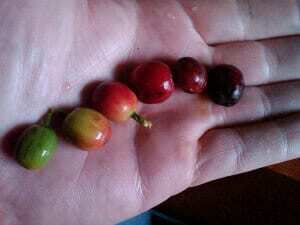 Like other fruits, coffee cherries have sugars that taste sweet when they ripen, making them more attractive to animals including but not limited to humans. Animals eat sweet fruits and then run, fly, scurry or hop around in the wild randomly pooping out seeds that take root in topsoil and the circle of plant life is complete. Coffee was thought to spread across Africa in the same way as slaves were captured and marched to the Middle East. What no plant ever expected is the effect that caffeine, coffee’s natural insecticide, has on human neural chemistry – essentially the biochemical equivalent of winning the plant lottery. 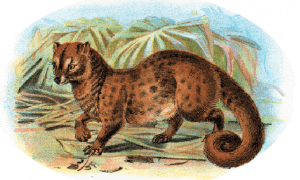 The palm civet lives in areas that grow coffee and also like to eat sweet things, so it became a pest to coffee farmers, much like the jacu bird of Brazil (yes, there is a jacu bird coffee too). Unlike the monkeys in India that chew and destroy coffee beans in the cherry, apparently the palm civet swallows many or all of them whole, which come out the other end. Some clever or more likely desperate farmer decided to try recover some of his beans by washing them off, a marketer put a twist on it and the legend was born. I have found no scientific proof that the palm civet is particularly choosy about selecting only the ‘ripest cherries’ as the myth states, but it seems plausible. Nevertheless, that no longer matters. With its sudden rise in popularity, the far majority of legitimate Kopi Luwak coffee sold today comes from grisly civet cat farms where rows and rows of the enslaved creatures bred specifically for coffee production are kept in small cages and force-fed coffee cherries -ripe or otherwise- until they die. How’s that dinner party conversation now? Sure, some Luwak coffee like that being sold by Dean & Deluca implies that is collected from palm civets roaming wild in nature, but even if it is true (which is unregulated and difficult to track), there is no justification to pay such obscene prices for coffee objectively graded to be of lower quality than your average office lobby Starbucks. If you feel the urge to buy Kopi Luwak, you’re much better off purchasing 1lb bag of coffee from Dunkin’ Donuts and donating the remaining $440 or so to the Humane Society or another local animal rescue charity. If you find any of the information above enlightening or disturbing, I urge you to never buy Kopi Luwak and be sure to let retailers like Dean & Deluca know why. If not for the embarrassment of being misled as a coffee novice or to discourage animal cruelty overseas, do it in support of true specialty coffee and the millions of farmers around the world that work hard every day to deliver quality coffee without a marketing gimmick. UPDATE 12/12/11 – The Kopi Luwak coffee product listed on Dean & DeLuca’s website has been removed! No statement was issued by the company, but we suspect that public pressure from our readers and those at Sprudge.com influenced the decision. Thank you all for your support, but don’t let it end there. Wherever you see Kopi Luwak sold, be sure to educate the seller and let the voice of reason and good taste be heard! UPDATE 01/10/12 – Dean & Deluca has resumed selling Kopi Luwak coffee, now at the 10% higher price of $55 and at a new web URL for the same product. The return of the product and new address causes speculation that the company waited for consumer pressure against the harmful gimmick to calm down, then reintroduced the product at a higher price recover lost sales — and at a fresh address not tainted by previous blog posts. 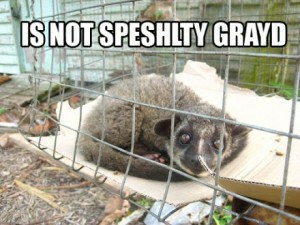 The company should know that our campaign against the Kopi Luwak gimmick will not end or quietly disappear. Don’t people feel disgusting to drink poop?? ewww.. and also it is cruel to keep those cats in cages.. after all they need the freedom too..